My week 7 adventure turned out a bit differently than I expected. We are at the end of the Korean school year which runs March to February with a 5 week summer break and a 5 week winter break. My 6th graders graduate today and then we’ll have a 10 day break for the Lunar New Year and what they call “Spring Vacation” before coming back to start a new school year March 2nd. Last week we had our end of the year teacher’s dinner. I intended to write about this as my adventure because last year’s end-of-the-year dinner was so eventful. Last year the dinner was held at a big wedding hall (you can read about my experience with Korean weddings here) where there was a huge buffet in a ballroom-sized room with a bunch of smaller private rooms off on the sides. So my school had a private room and after the meal there were farewell speeches where they had a champagne toast to teachers who were leaving and did a weird ceremony where they cut what looked like a wedding cake together with this giant knife. Afterwards, they brought in a karaoke machine and we had obligatory norebang time. Norebang is the Korean style of karaoke and it is wildly popular here, especially for “professional development” kind of events. Last year I had to sing “Call Me Maybe” as a duet with the 50 year old music teacher, Mr. Kim, and was treated to my barely five-foot-tall vice principal singing something in Korean while jumping up and down the whole time. It was a riot. Needless to say, I had high expectations for this year. I was a little let down. Instead of the wedding hall we went to a small hole-in-the-wall traditional Korean restaurant where we sat on the floor (always tough on the knees and tailbone, etc after a while). There was only a brief good-bye speech for the teachers who were leaving. Then we ate a traditional Korean meal together, after which we all left and went home. It was anti-climactic, but it was my only adventure planned for the week, so it will have to do. The most adventurous part of it was probably some of the food itself. A traditional Korean meal is 30 or more small courses or side dishes called “banchan.” The servers bring out dish after dish and everyone shares them (like, you just reach over with your chopsticks and grab whatever your want. You don’t get your own plate). I tried to get a few pictures of this, but my phone camera is awful and it was difficult because the teachers didn’t want to be in the pictures. See what I mean. Awful camera and no good way to get all the food without getting the teachers. Among the more exotic dishes were the jellyfish salad (which I actually kind of enjoy) and a dish with stingray and bean sprouts in a red pepper sauce. Stingray is very stringy and kind of sweet, just fyi. 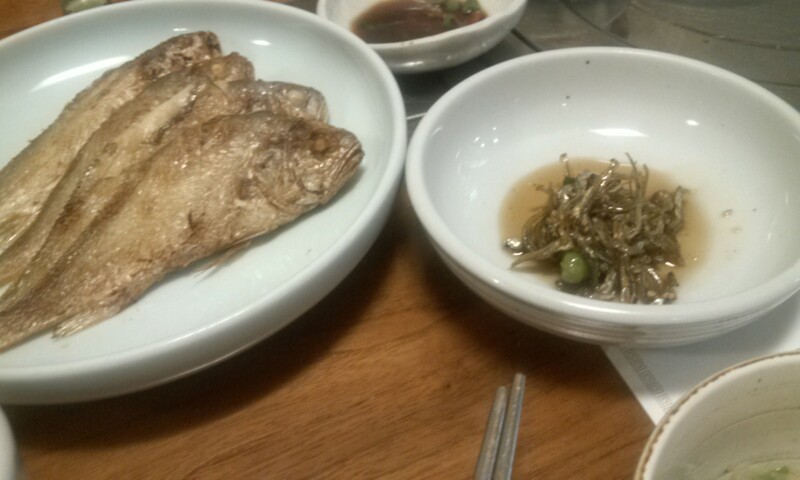 There were whole cooked fish, which were delicious, but didn’t look appetizing what with their eyeballs staring at you, along with the little dried anchovies that look like nothing but eyes. 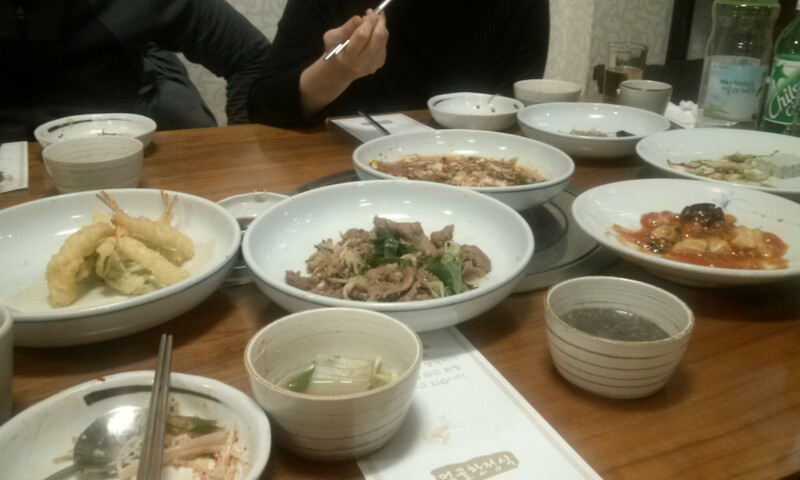 There was yukhwe, a raw beef dish, and japchae (glass noodles with beef) and of course, kimchi. Big fish and little fish. Sorry this picture is so blurry! People often ask me if I like Korean food and I never really know how to answer. I’m not an especially picky eater, though I don’t like my meat to be super fatty and I only like the octopus tentacles and not the whole baby ones with the heads attached, so maybe that makes me picky. There are some Korean dishes that I really love – bulgogi and jjimdak and dumplings and galbi (bbq). And there are others that I really don’t care for – makjang (pig colon) and raw liver and chicken hearts. Overall I would describe my relationship to Korean food this way – I like a lot of things, but only in small amounts. I enjoy them, but I only want one or two bites of each thing, not a whole plateful. Which is why these big shared meals work out well for me. I can get away with one or two bites of everything without seeming rude. Unforunately, in spite of eating it a few hundred times at this point, I still really don’t like kimchi which means I could never be fully accepted into Korean society. We are headed to Seoul tomorrow for the Lunar New Year (a huge holiday here in Korea) and I have some bigger adventures planned for this week, so stay tuned! Ugh. I kind of cringe when there is no serving spoon or fork. Jellyfish salad sounds interesting, What does it taste like? Stingray and anchovy are pagi and dilis here. Not sure where you put the anchovies in the pic but we like to dip crunchy dilis in vinegar. There are also dried dilis coated with some caramelized sugar and we can buy those from some places. I also don’t like kimchi. I got to taste it a few times and I’ve never really liked it. Well, it’s usually a private room you rent and then you have mikes and lights and backup instruments like tambourines and you pay by the hour for the room. (Norebang literally means song room). And then you sing a lot of K-pop or other Korean songs, but there are a few pages of English choices. Meanwhile lights swirl all around you and an unrelated music video plays while you sing. It’s a grand old time. I did not dance to Gangnam style. Koreans have very mixed feelings about Psy, hah. All Korean restaurants are family-style with everyone eating out of the same dishes. Even soup. Which I find really hard to get all the way from the pot in the center of the table to my mouth without spilling. The jellyfish salad mostly tasted like whatever sauce was on it – kind of tart and vinegary. Mostly it’s just this interesting texture like rubber bands. You just eat the anchovies plain here. They are in a little dish that has some sort of liquid in it already. The liquid is slightly sweet but the anchovies are salty. These were dried ones I believe – more chewy than crunchy. Koreans always think it’s the spicy-ness of the kimchi that foreigners don’t like. (They are convinced that Americans cannot eat spicy food). But I actually enjoy pretty spicy food. My problem is the combination of spicy with the sour fermented taste. Plus I don’t like the texture because it reminds me of wilted lettuce or some other leaf that’s gotten soggy and I really don’t like that. Norebang does sound like the videoke bars here except they are more interesting with the backup instruments and all. And i don’t like Psy and his songs, let that be on record (ha ha haaa!!!). Regarding soup, from what I know, in some cultures, it is rude not to make a sound when you slurp. Is it like that in Korea or the opposite? Based on the koreanovelas (what we’ve dubbed the proliferation of Korean soaps that have invaded this country this past decade) we’ve seen, Koreans seem to eat heartily. It makes me hungry when I watch them eat. The anchovies are salty, that I know. And yes, can be chewy. Why you don’t like kimchi are EXACTLY the reasons why I don’t like it. Everything that you said you don’t like about it. Another great blog post. You’ve got me excited for next week’s about the Lunar New Year. Can’t wait!